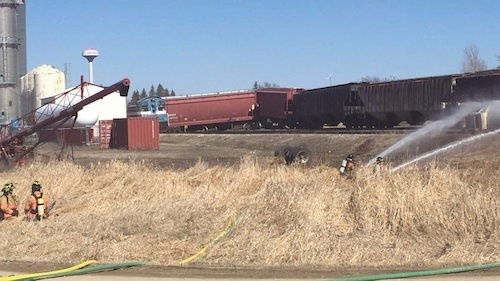 After an explosive collision between a propane truck and CP rail train forced the entire town of Callaway, Minnesota to be evacuated Thursday, the roads were re-opened and residents were finally able to return to their homes Friday morning. 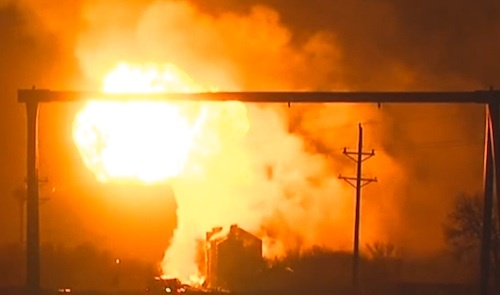 The tiny 220 person town of Callaway, Minnesota was rocked to its core Thursday, when a train derailed and collided with a fuel tanker, causing a massive explosion at around 12:30 pm. Residents were simply going about their day, when suddenly sirens started going off and word quickly spread about the tragedy unfolding. Carol Tungesvick says that she had been working in her shop when a girl came in and told her, "’I think there's been a train derailment down by the elevator' and that sounds like it's anhydrous to me." It was actually a semi-tanker filled with 10,000 gallons of propane that took the entire night to burn off after being struck by the train. Contrary to studies involving several recent train/truck collisions, this time the semi-truck driver appears not to be at fault. The Becker County Sheriff's office says that miraculously no one was killed in the crash and even the semi-truck driver managed to escape with no reported injuries. However, two people on the train were treated for non-life threatening injuries and later released. The biggest concern for all emergency responders assisting with the incident was keeping the fire under control and keeping the residents safe. They did so by ordering a mandatory evacuation for the entire town of 220 people. Later in the day police escorted only a few people back to their homes for medication. According to Sheriff Todd Glander, another near tragedy occurred Thursday evening just after 10 p.m. when a propane tank that crews were watching suddenly blew out all of its contents. Luckily nobody was injured and all personnel in the area have since been accounted for. On Friday morning, Glander finally announced that the threat to the public had passed and residents were allowed back into their homes and the roads were re-opened by 10:00 a.m. A total of about 60 officers from local, county and state agencies came together and made a team effort to understand the severity of the situation and do what was needed. 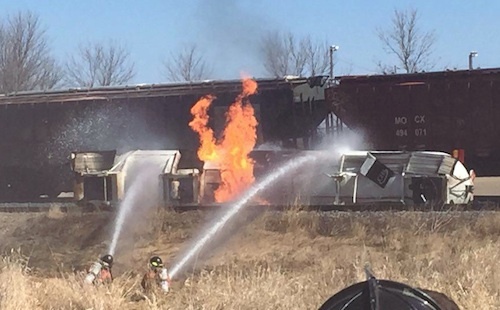 Twenty-one fire departments, eight law enforcement agencies, three ambulance services, the State Fire Marshal’s office and Canadian Pacific Railroad officials also assisted in the response. Sgt. Jesse Grabow commented, "Any time a vehicle ends up against a train is usually not good." The Minnesota State Patrol added, "Crashes involving trains that people can walk away from, in that sense are very lucky. I mean it could always be worse." I've read it's NOT the drivers fault and then this morning the railroad is saying they have video and it IS the drivers fault....who knows. .
Yep, looks like they've switched gears and blaming the truck driver now. The article said the train derailed and then hit the truck!! Yes, unfortunately today's reports are blaming the truck driver for stopping near the tracks. How nobody got killed is amazing especially if the truck driver was near the truck. If he was he must be one fast runner. Trains always safer than a pipeline !!!!! Right???? That damn train just turned right out in front of him I bet . They will find something to blame him....always do. Read the article....it wasn't a signal....he was parked beside the tracks and the train DERAILED and got the truck.